“No matter who I play with, if I’m playing a game of Go I am enjoying myself,” Hua Xueming 7P said through a translator during the Ruilong Primary School visit. “Even just last night I played four games, until midnight!” In the discussion room during the top eight round, she played a four-stone game with Jeff Shaevel (photo top right). 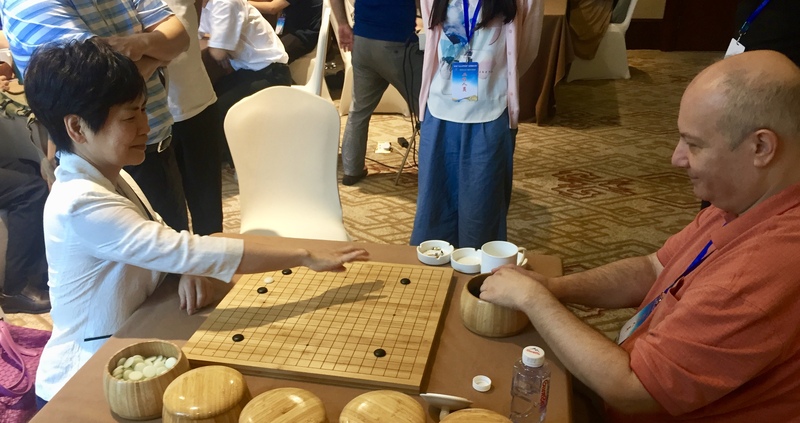 Competition Officer Liu Jing 8P expressed similar feelings at the event, emphasizing that when he sees children playing and enjoying Go it makes him happy, because it reminds him of when he played as a child and how much he enjoyed it. 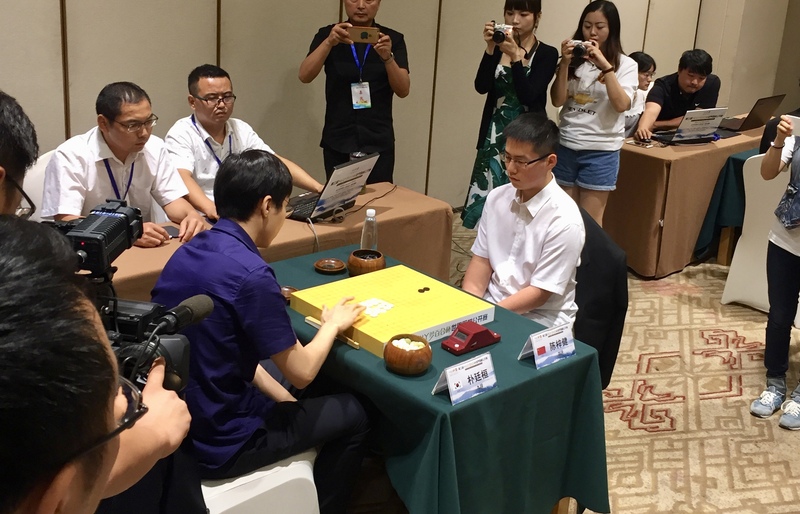 All in unison, following announcements of Wang Runan 8P, President of the Chinese Weiqi Association, players took stones from their bowls to choose for color, arranged the bowls appropriately, and started their clocks to begin the top eight round games. Park Jungwhan 9P and Chen Zijian 4P chose black and white respectively (photo top left). In the discussion room during the top 16 matches, Hua Xueming played a go game with tournament sponsor Ni Zhanggen while everyone watched the tournament games projected on a screen at the front of the room. 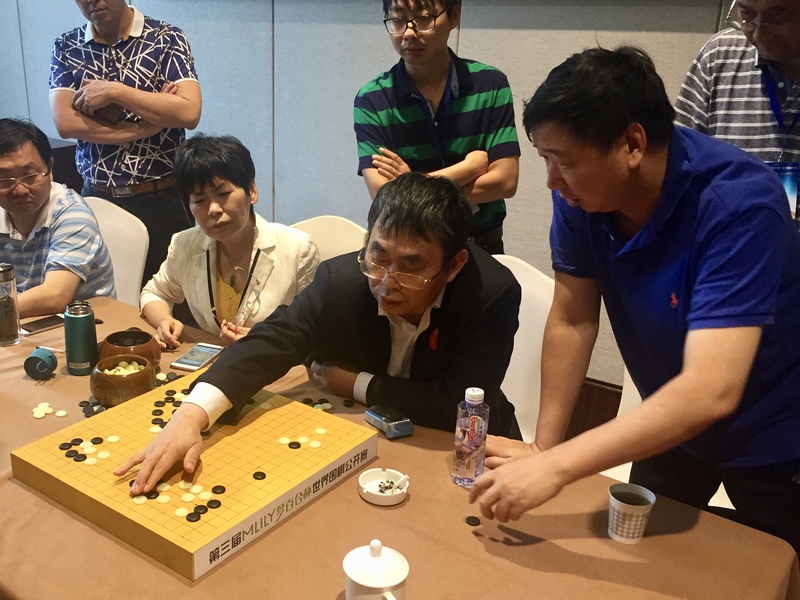 During the top eight matches Hua Xueming 7P, Nie Weiping 9P, and Yu Bing 9P focused on a lively review of the tournament games in progress (photo bottom right). 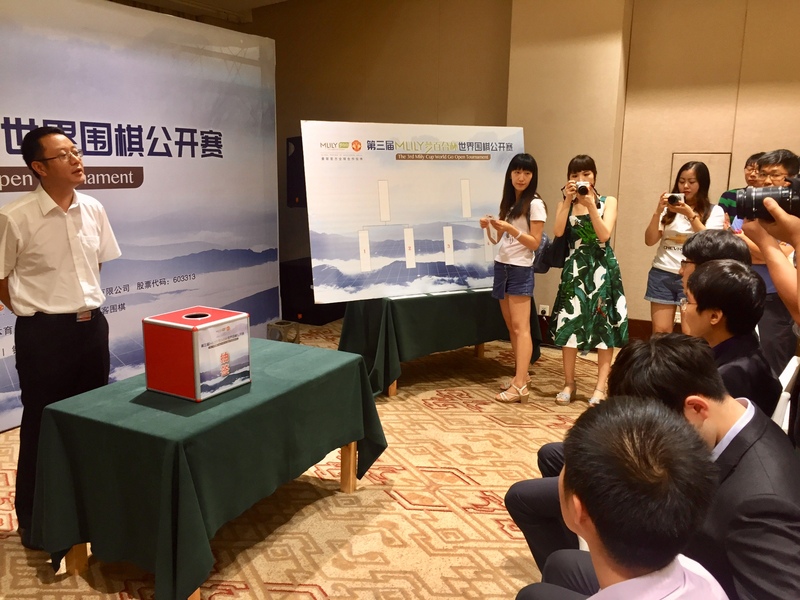 Competition Officer Liu Jing 8P introduced each of the four semi-finalists and prepared the box from which each player would choose their position and opponent for the best-of-three semi-final round (photo bottom left).